Main » 2010 » May » 2 » Mighty Baby - 2004 - Live! Mighty Baby - 2004 - Live! This superb late sixties underground band were formed from the remnants of pop/soul band The Action, who were popular around the London mod club circuit and issued five singles on Parlophone, including I'll Keep Holding On and Shadows and Reflections between 1965-67. Both Mighty Baby albums are now very rare. The first, in particular, has a definite psychedelic West Coast influence. Both are important progressive releases and Mighty Baby had their own distinctive and imaginative sound. Their music was often a sophisticated interplay between the twin guitars of King and Stone and the woodwind accompaniment of Whiteman. Its influences were wide-ranging from jazz (Egyptian Tomb) through to country rock (I'm From The Country) and Some Way From The Sun, notable for an hypnotic guitar intro. Egyptian Tomb is unquestionably the most inspired moment on their first album - melodic guitar playing set to a jazzy arrangement. Alan King later played in Ace whilst Martin Stone later fronted Chilli Willi and Red Hot Peppers. 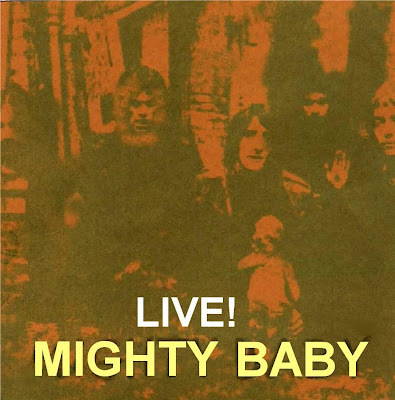 Mighty Baby also played on lots of other albums, including Reg King's and others on Head. Evans, Powell and Whiteman were later in Habibiyya. Aldo, do not let this св, which claims guys took Attis and to add something, I got to do with? Wrong, this is a cut down version of "Live In The Attic" (from 1969) plus the Glastonbury track. Best to track-down the Sunbeam issue! Although this does have the best rip of "A Blanket..." that I've heard yet, so was worth the download for that!